A Northwestern University research team has developed a 3-D printable ink that produces a synthetic bone implant that rapidly induces bone regeneration and growth. This hyperelastic “bone” material, the shape of which can be easily customized, one day could be especially useful for the treatment of bone defects in children. The findings were published in the journal Science Translational Medicine. 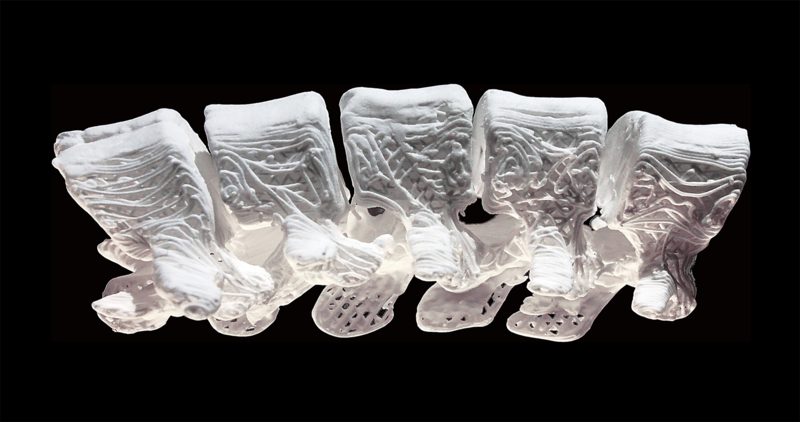 A hyperelastic bone in the shape of a section of the human spine, 3-D printed using an ink developed at Northwestern University. Shah and her team aim to change the nature of bone implants, and they particularly want to help pediatric patients. Shah is an assistant professor of Surgery in the Division of Organ Transplantation at Feinberg and of Materials Science and Engineering at the McCormick School of Engineering. Adam Jakus, PhD, a postdoctoral fellow in Shah’s laboratory, is the first author of the paper, which evaluated the material with human stem cells and within animal models. Shah’s 3-D printed biomaterial is a mix of hydroxyapatite (a calcium mineral found naturally in human bone) and a biocompatible, biodegradable polymer that is used in many medical applications, including sutures. Shah’s hyperelastic “bone” material shows great promise in in vivo animal models; this success lies in the printed structure’s unique properties. The material is majority hydroxyapatite, yet it is hyperelastic, robust and porous at the nano, micro and macro levels. 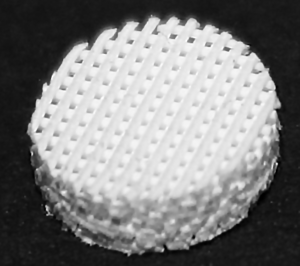 A close-up view of a hyperelastic “bone” scaffold. While hydroxyapatite has been proven to induce bone regeneration, it is also notoriously tricky to work with. Clinical products that use hydroxyapatite or other calcium phosphate ceramics are hard and brittle. To compensate for that, previous researchers created structures composed mostly of polymers, but this shields the activity of the bioceramic. Shah’s bone biomaterial, however, is 90 percent by weight hydroxyapatite and just 10 percent by weight polymer, and it still maintains its elasticity because of the way its structure is designed and printed. The high concentration of hydroxyapatite creates an environment that induces rapid bone regeneration. That’s not to say that other substances couldn’t be combined into the ink. Because the 3-D printing process is performed at room temperature, Shah’s team was able to incorporate other elements, such as antibiotics, into the ink. One of the biggest advantages, however, is that the end product can be customized to the patient. In traditional bone transplant surgeries, the bone — after it’s taken from another part of the body — has to be shaped and molded to exactly fit the area where it is needed. Using Shah’s synthetic material, physicians would be able to scan the patient’s body and 3-D print a personalized product. Alternatively, due to its mechanical properties, the biomaterial also can be easily trimmed and cut to size and shape during a procedure. Not only is this faster, but also less painful compared to using autograft material. Shah imagines that hospitals may one day have 3-D printers, where customized implants can be printed while the patient waits.